Denny’s invites you to stuff yourself as often as Hobbits with selections from its Middle-Earth-themed menu, coming November 6 as a tie-in with The Hobbit: An Unexpected Journey. And being a fan I’m sure you’ll give the idea some thought. The advertising campaign has already kicked off in Los Angeles. 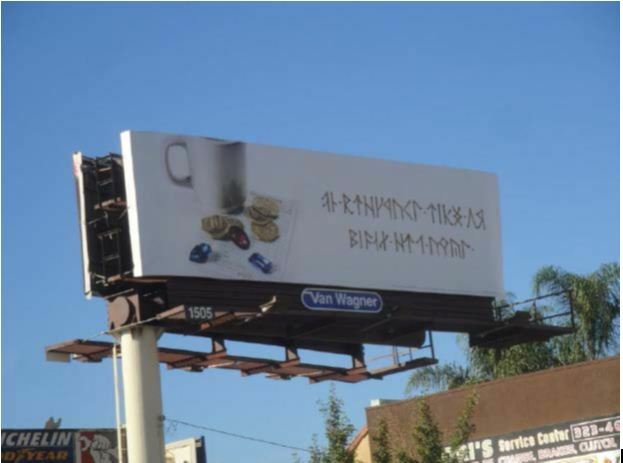 Around town are unbranded billboards displaying a message written in runes. 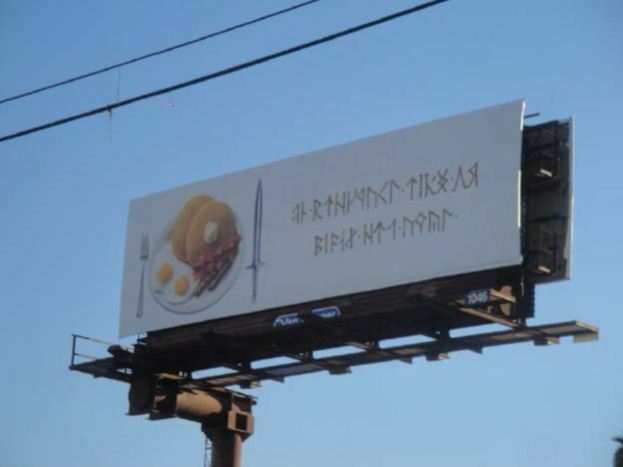 Translation: “Middle Earth is coming to America’s diner.” English text will replace the runes on October 24. TV spots promoting the menu will air beginning November 12. 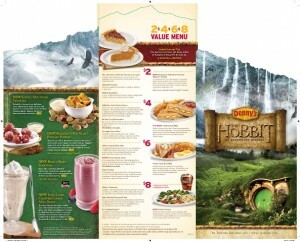 Denny’s customers will also receive a trading card pack with select “Hobbit”-inspired entrees that include collectible cards — there are 12 in total to collect — and Denny’s coupons. The chain will also put QR codes on placemats that will provide customers with additional “Hobbit”-related content such as videos, online games and a behind-the-scenes look at the national TV spot. Hobbits eat seven meals a day – breakfast, second breakfast, elevensies, luncheon, afternoon tea, dinner, and supper. Once Denny’s publicity takes hold Taco Bell’s “Fourthmeal” will sound like nothing more than a healthy snack. This entry was posted in Skiffy and tagged J.R.R. Tolkien, The Hobbit by Mike Glyer. Bookmark the permalink. The mind boggles–or gobbles. I wonder if Denny’s will offer “orca-cola”, such as was found in “Bored of the Rings. I wonder what ol’ JRR would think of all this. Wait, there’s a villain that rhymes even better — “Trolla-Cola”! I’d stay away from the Orc Omelettes. Anyway, it is rather mind boggling to think of having advertising in runes. Skiffy has won. Another place that I avoid, now has another reason to be avoided. I never thought Middle Earth was filled with grease. Maybe they will refuse to serve Hobbits. They probably advertised in runes because they couldn’t figure out the charts for the tengwar alphabet. I think the good Prof would be mad as hell, as he should be. I hate such merchandising. Unfortunately, the “good Prof” would also be as mad as hell about the movies — he didn’t like films as I recall. He sold the rights, because he needed the money, but was of the opinion that the movies would never be made. Indeed, Stanley Kubrick turned the directing job down, on the grounds that nobody’s filmmaking, even his, could ever do the book justice. I rather like the movies, though they certainly have a different character than the books. What movies are ever exactly like the literature they are based on? It has nothing to do with liking or disliking the movies as movies, either. The films did the book justice because they left Tom Bombadiddle out. I know that spelled wrong. The filmed versions of LotR were already 13 1/2 hours long, taken together in their longest versions. “To do the books” justice might be interpreted a number of ways, but I’m going to assume you mean that not all of the millions of details or every sub plot were included in the filming. It’s hard t argue against that — vast amounts were left out. I suppose nobody thought it would be a good idea to produce the first billion dollar movies, or for them to run 11 hours each. It’s hard to argue against that, either. I haven’t gone through the “Compleat” LORD OF THE RINGS DVDs, though my son and daughter have done so more than twice. Sometime I’ll give it another viewing, but I tend to like shorter material to fill in time before I excuse myself to go to sleep. I keep some marthon ideas when I’m snowed in or a weekend by myself. I did SEIGFRIED –The silent films by Fritz Lang–running time is 5 hours–the last time. My son gave LOTR a reading, and dropped it because no one killed Tom Bombastdoodle. To do justice to a literary work in a movie does not mean to reproduce every jot and tiddle of plot, either. Surely you’re not dense enough to think that’s what Kubrick meant. He meant that a movie couldn’t convey the greatness and scope and depth of the story, and sure enough, it didn’t. loss and a gain because one medium has advantages and disadvantages that the others do not have. Lard of the Rings does no justice to the movies or the book. Frodo French fries is not a good idea. Gollum shakes is not a good idea.